Upset over a dispute with his wife over his alleged illicit relationship with another woman, a homoeopathic doctor allegedly poisoned his three children and later consumed the same substance at Aman Nagar behind Greenland Public School this morning. The police has nabbed a proclaimed offender at large for the past 19 years on the charge of kidnapping a woman in 1986, whom he had married later and had been living with her and their two children when the police arrested him. 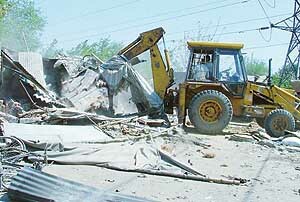 With the approaching of the April 8 deadline given by the high court to the local municipal corporation to submit status report on a list of illegal structures, the civic body started its demolition drive and razed some encroachments on the GT Road here today. Three persons including a woman riding on two scooters were injured in a freak accident when a dried up Euclyptus tree fell on them near Amaltas hotel on Ludhiana-Jalandhar road today afternoon. Confusion prevailed among parents and undergraduate students over cancellation of today’s examination. Though news of cancellation of exam spread like a wild fire, still harassed parents and their wards queued up at city colleges to confirm the cancellation. What do you feel about Indian English fiction? With the outward mobility of Indian fiction writers in English, especially in the last two and a half decades, the zone has expanded the most in scope and effect and the focus remains on inter-cultural friendship and social relations. Residents of a colony at local Gaushala Road today protested against the management of Punjab and Sindh Bank for allegedly supporting a swindler who had duped the residents by selling property worth millions that had already been mortgaged with the bank. Local Congress leaders have rallied behind Chief Minister Amarinder Singh defending him against estranged leader and former Member of Parliament Jagmeet Brar. Mr Jagmeet Singh Sahota was elected as vice-president of the local municipal council at a meeting held at the municipal complex here yesterday. The police has nabbed kingpin of a gang of burglars and recovered goods stolen from nearby towns and villages. He was also wanted in a theft case registered at local police station also. 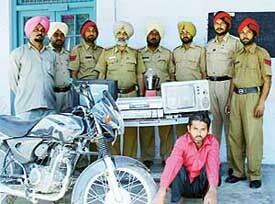 A police team with a person held for theft and stolen goods in Mandi Ahmedgarh. Bajaj Chetak Scooter (No. PB25-4011) was stolen from Agwar Gujjran by some unknown persons. The local police has registered a case under Section 379 IPC on the complaint of the owner Iqbal Singh of village Malak. Chief Parliamentary Secretary Malkiat Singh Birmi formally inaugurated the procurement operation by government agencies at the Sahnewal Grain market today. He supervised the auction of wheat heaps which had arrived in the mandi. Much against the advice of scientists and the government, farmers have started sowing paddy much earlier. While the government has always asserted that they should not sow it too early lest it put additional strain on the water resources, there has not been any effort on its part to create awareness among them on the issue. Annual Prize Distribution Function was held in Shaheed Joginder Lal Pandey National Public Memorial School, Industrial Area, here today. Mr Surinder Dawar, Parliamentary Secretary was the chief guest while Mr Rakesh Panday, Minister of State, Science & Technology presided over the function. New English Model School, Duleep Nagar, organised its annual function near Municipal Park yesterday. The College Development Council Fund — a fund generated by the students for the development projects of college, faculty and themselves — seems to have lost its objective with Punjab University deciding to provide 50 per cent of the admission fee of the wards of the confirmed college employees out of the fund. The staff and students of BNSM College of Technical Education Alamgir visited stock exchange today. Mr J.S.Juneja, Executive Officer explained the operations of stock exchange. As Panjab University has tried to reduce its burden by issuing permanent identification numbers to first year students of undergraduate classes from the current session, it is being apprehended that the exercise may prove to be more ‘burdensome’ for the students and staff, who have to actually implement it. Punjab Agricultural University will soon acquire sophisticated electronic microscope costing about Rs 3.5 crore. Disclosing this here yesterday, Dr M S Tiwana, Dean, College of Agriculture, said the Indian Council for Agricultural Research, New Delhi, had sanctioned Rs 3.50 crore for the purchase of electron microscope in the PAU. In view of the teachers’ boycott, the Panjab University has already postponed all its examinations for today but the teachers of Malwa College Bondli-Samrala staged a massive protest dharna in the college campus under the guidance of Union President and PCCTU Executive member Prof Baldeep Singh and Secretary Prof Baljit Singh. The Punjab Students Union has threatened to launch a stir against the state government’s decision to allow private organisations to start technical courses and privatise the existing ITIs. It has resulted in a massive increase in fee and lack of facilities in these institutes. Pre-litigative lok adalats pertaining to bank loan cases, being organised in view of a national-level Lok Adalat to be held on April 10 here, are proving a boon for loan defaulters as well as banks. The defaulters are happy as they are getting ‘’maximum concessions’’ in waiving off the interest amount. Thirty seven cases were settled at a lok adalat organised at Khanna Court Complex here today. Ms Priya Sood, Civil Judge, Senior Division, was the presiding officer. Ms Rekha Bhardwaj, Principal, Dr Mamta Sood and Naveen Thamman, president of Bar Association, Khanna, were also present. A city-based young scholar and writer has won literary distinction. Dr Kulwinder Kaur Minhas has published a collation of essays in the book form ‘Jinni Chakhia Prem Ras’. The book in Punjabi has won the author recognition for the richness of content and lucidity of prose style. This book drew the attention of Central Institute of Indian Languages (Ministry of Human Resource Development, Govt of India). At least 102 tubectomy operations were performed at a family planning camp organised by the District Health Administration at the local Civil Hospital on Thursday. A blood donation camp has been organised by the Desh Bhagat Institute of Education, Mandi Gobindgarh, in association with the State Bank of India. As many as 69 volunteers has donated blood at the camp. The Ludhiana Central Excise Commissionerate, comprising nine districts of Punjab, has collected Rs 947 crore as revenue during the financial year ending March 31, 2005 as against the original target of Rs 940 crore for the year. A drive by the Municipal Corporation to remove dairies in Karamsar Colony proved futile when dairy owners returned with their livestock within half-an-hour of the departure of MC team. A team of the MC demolition wing, accompanied by the police, had visited the colony to remove the dairies in the morning today. But soon after MC employees untethered the cattle and left from the spot, the owners brought them back and tethered them at their place. 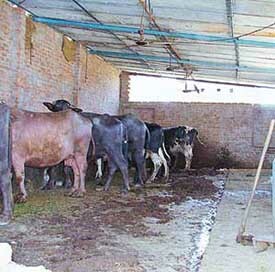 Cattle back in one of the dairies from where these were removed by an MC team in Ludhiana.